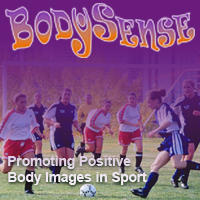 BodySense is an education and outreach program that promotes positive body image in athletes, with the ultimate goal of preventing disordered eating. The main tool is a best practice model which identifies the 10 BodySense Basics. The 10 BodySense Basics can guide you to improve the climate in your team or club, and to best support athletes who are at risk of developing negative body image because of the demands of their sport. The program speaks to athletes themselves, but also to the people that influence them such as parents, teachers, coaches and leaders in the sporting community.